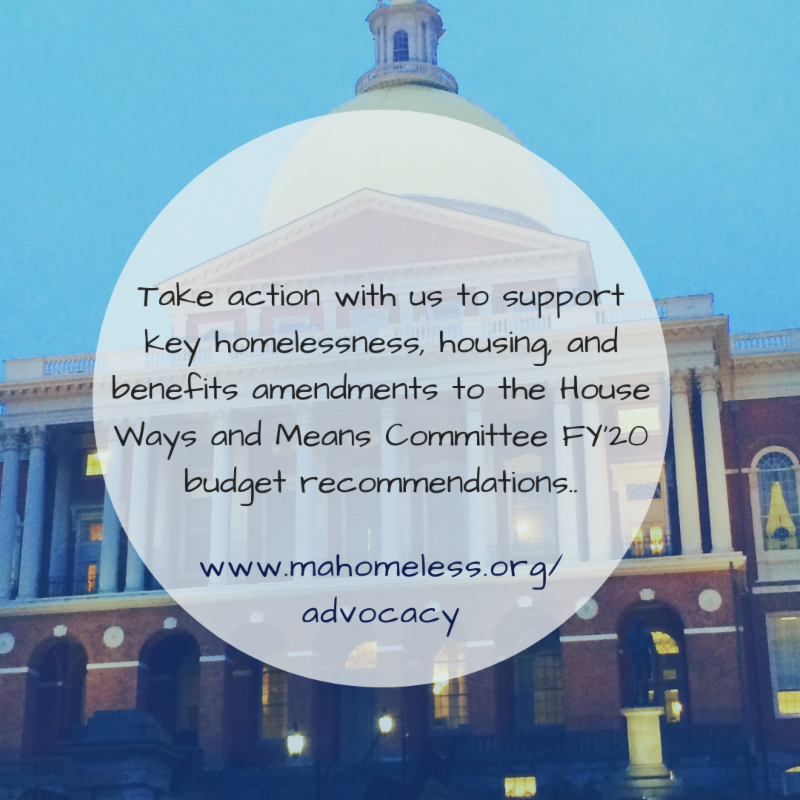 We were very pleased to see so many of the Massachusetts Coalition for the Homeless' priorities reflected in the House Committee on Ways and Means fiscal year 2020 budget proposal. We are writing today to ask for your support for several key budget amendments that would further strengthen the House budget. Rent Arrearage Assistance Program (RAAP) amendment to line item 7004-9316 to be filed by Representative Marjorie Decker to create a $7 million upstream homelessness prevention pilot program within the Residential Assistance for Families in Transition program (RAFT) to help households pay for back rent and mortgage payments: fact sheet. Please sign on by contacting Akriti Bhambi in Rep. Decker's office by 3 p.m. tomorrow (Friday): akriti.bhambi@mahouse.gov. Emergency Assistance (EA) amendment to line item 7004-0101 to be filed by Representative Marjorie Decker to ensure that families experiencing homelessness do not have to sleep in places not meant for human habitation before becoming eligible for EA shelter: fact sheet. Please sign on by contacting Akriti Bhambi in Rep. Decker's office by 3 p.m. tomorrow (Friday): akriti.bhambi@mahouse.gov. Youth homelessness amendment to line item 4000-0007 to be filed by Representative Jim O'Day to increase funding for housing and wraparound services for unaccompanied youth and young adults experiencing homelessness: fact sheet. Please sign on by contacting Alexis Foley in Rep. O'Day's office by 3 p.m. tomorrow (Friday): alexis.foley@mahouse.gov. Mass ID access amendments to line item 1595-6368 and a new outside section of the budget to be filed by Representative Kay Khan to ease access to standard Mass IDs for people experiencing homelessness: fact sheet. Please sign on by contacting Jessie Brunelle in Rep. Khan's office by 12 p.m. tomorrow (Friday): jessianne.brunelle@mahouse.gov. See our House budget page for additional details, fact sheets, etc. We will be adding more details about relevant amendments to that page in the week ahead, leading up to the House budget debate the week of April 22nd. Thank you so much for helping to lay the groundwork for the positive budget recommendations and your ongoing work to improve the budget even more to address and end homelessness!